In my last post, I shared an elegant portrait of the celebrated dancer Auguste Vestris (1760-1842). There are, however, a good many more images of both Auguste and his father, Gaëtan (1729-1808), from the time, and they're far less flattering. 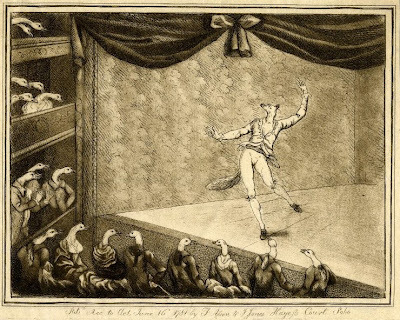 There was much about the two dancers that made them the perfect targets for the infamous satiric caricaturists of late 18th c. London: they were extremely popular on the stage, they were handsome, athletic, and fashionable, they made a great deal of money, and, most of all, they were foreigners (Gaëtan was a Florentine with a German wife, while his illegitimate son Auguste had been born in Paris to a French mother). It didn't matter that father and son weren't particularly politically inclined, or that they traveled from one country to the next for work, much as performers do today. To the English caricaturists they were plundering FRENCH, and since England was perpetually at war with France during the 18th c., that was enough. It's interesting that in several caricatures, it's not Gaëtan or Auguste who are the ridiculed the most, but the English audiences who supported them. Both of the drawings here are accompanied with long, scolding verses that liken the Vestris supporters to not-very-bright geese. The print, below, is even more direct: A Vestrician Dish, or, Caper Sauce for a Goose Pye. Auguste is shown dancing gracefully on the stage of the Opera-House in the Haymarket, but the artist has replaced his head with that of a wily fox, and given him a fox's tail as well. His English audience hasn't fared any better: they're all shown as a flock of too-trusting, admiring geese under his spell. Here's part of the caption; read the rest here. If they were not a mere Set of Cackling Geese. That so prettily tickles our English Geese. Top: Detail, Six guineas entrance and a guinea a lesson, print by Paul Sandby, c. 1782-84. The British Museum. 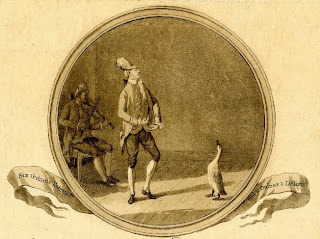 Below: Detail, A Vestrician dish, or a caper sauce for a goose-pye, published by F. Assen & J. Jones, c. 1781. The British Museum. Isabella, To write such a piece you must REALLY know the history. Well done. This is fascinating. I love the detailed information about minor figures from the past—the ones who aren't important politically or militarily and therefore don't make it into history books. One thing I'm curious about. You mention that both Gaëtan and Auguste made a lot of money. But what constitutes a lot of money for a performer at this time? Was it payment or gifts? Did female performers also get wealthy from their performing careers? I saw the Dandies/Artists show at RISD, too, and I remember this man's portrait. Very striking! So interesting to learn more about him. What a shame there is no video from that time so we could see him dance today. He must have been pretty fabulous! The fox-headed drawing strongly resembles the work of 20th century illustrator Edward Gorey, both in strangeness and in linework. I would never have guessed it was 18th century. 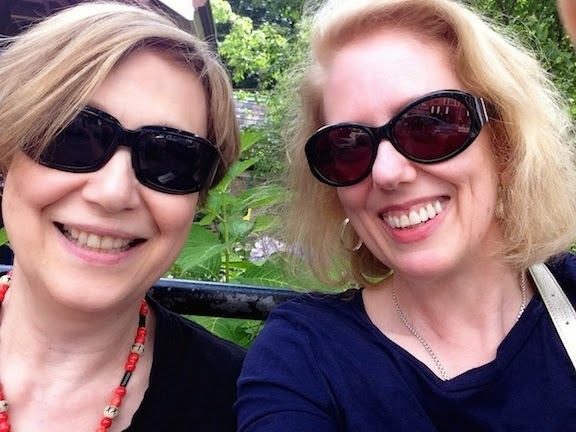 What a pleasure to have stumbled upon this blog beautifully written, witty, informative. Altogether splendid.